To set the scene: Tweet Break was written in C# and XAML (which I’m reasonably fluent in) and I’ve already built a few apps for the Windows Store and a couple of Windows Phone apps. 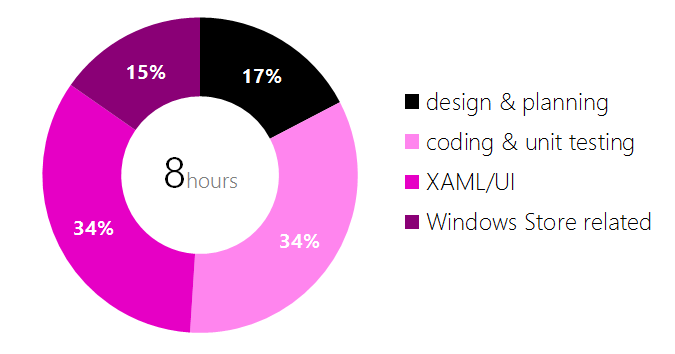 The chart below is a breakdown of the general areas of effort: development work (XAML and coding) took approximately two thirds of the total time with the remaining third split almost evenly between Windows Store submission and design related tasks. If I had left the colours, list box styling, etc. as the defaults and not spent time playing with different ideas; then the total time would have been around 6 hours. Initial app submission failed certification for seemingly silly reason in the human testing component such as “The app appears to have dependencies on non-Windows Store style APIs”. In order to help the testers I have resubmitted the app, this time with testing notes that address the specific alleged content compliance failures. Tweet Break certified and in store. By supplying detailed tester notes when submitting the second time, explicitly addressing each of the certification failures, the app passed certification the second time. The Windows Store Twitter apps that I use don’t have multi-Tweet capability. This is where you can typed more than 140 characters and it gets split up to smaller 140 character chunks that you can post separately. Tweet Break is a simple app to bridge this functionality, you type you long content then choose each part in turn and share it to your favourite Twitter app. In doing this, Tweet Break embraces the Microsoft Design Principle of Win As One that says (amongst other things): “Work with other apps to complete scenarios by participating in app contracts”. In doing apps like this and embracing Windows 8 features such as the share contract, we can start to think of overall experiences, rather than purely in terms of app features. Tweet Break is a free download.